When a situation calls for an immediate response and an enemy must be found and neutralized, a team of special operators under presidential directive moves in. Stony Man cyber specialists stay close to ground events in real time, while direct action units engage the combatants with precision and lethal force. 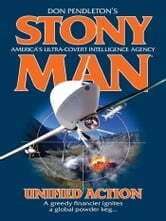 Two red-hot situations a world apart put the Stony Man strike teams on separate hunter-killer operations in unstable regions. In the urban hellgrounds of Domincan Republic, Able Team follows the blood trail of mysterious military contractors. Across the globe in Kyrgyzstan, Phoenix Force stalks a group of dangerous extremists with terrorist connections. But a stunning link between the two operations puts the Stony Man teams on the hunt for a ruthless financier who is plotting a massive wave of terror for profit.